Finally, this bone-crushing masterpiece is available on compact disc, through Vault Of Dried Bones. After 11 years of defiling the underground, Canada’s Necroholocaust deliver their long-awaited debut album, Holocaustic Goat Metal. One of Canada’s best-kept secrets, Necroholocaust honor their country’s venerable tradition of blackgrinding ultra-violence, as established by gods of war Blasphemy and Conqueror, as well as other foundational bands like Archgoat and Germany’s Blood. Uniquely, Necroholocaust began as a studio-only project that utilized a primitive, pulsing drum-machine. As years went on, the band developed into a commanding live force, and further developed their barbaric onslaught across splits with Blasphemophagher, Deiphago, Obeisance, Baphomets Horns, Godslaying Hellblast, Manticore, and Satanik Goat Ritual among others. Here, on the tellingly titled Holocaustic Goat Metal, Necroholocaust have delivered their most gutsfucking, OTT material to date – literally, “Holocaustic Goat Metal” that’s neither strictly black metal, grindcore, nor death metal – and seal its fate with a powerful ‘n’ punishing production. Whether inciting violence and bloodshed or establishing a ritualistic trance, you will be possessed by Holocaustic Goat Metal. 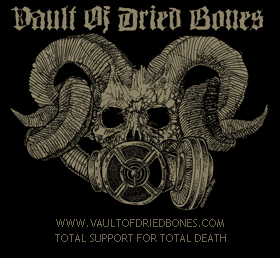 This entry was posted in News and tagged death, holocaustis, necroholocaust, total death, vault of dried bones. Bookmark the permalink.